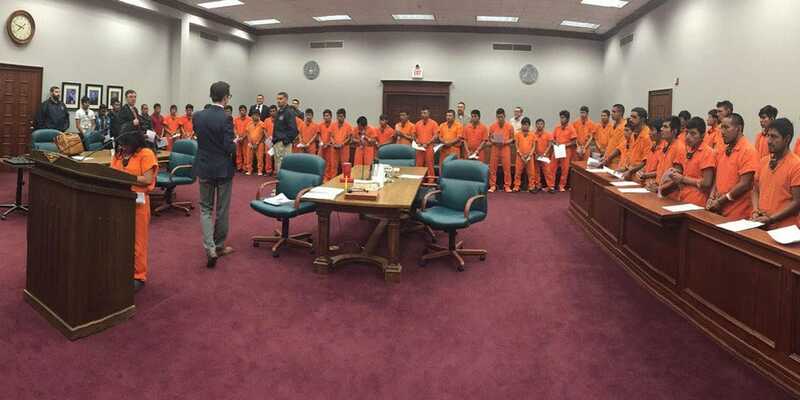 A leaked photo from a Texas courthouse shows 37 people accused of illegally entering the US being processed all at once. In these kinds of trials, defendants are often expected to answer questions in unison to save time. It’s illegal to take photos in federal court, but somebody broke the rules to get the image out. The image has been circulating online in the legal community and was published recently by The Intercept. Though they might be unfamiliar to many, trials like this have been going on in border courts for more than a decade. The Trump’s administration’s “zero-tolerance” immigration policy is making such scenes more common. A leaked photograph shows 37 defendants in orange prison jumpsuits shackled at the hands and feet to be processed en masse as part of the ongoing US clampdown on illegal immigration. The image, leaked to the media, gives an unfamiliar glimpse into “Operation Streamline,” a prosecution system in which up to 70 defendants in immigration cases can be charged and sentenced at once. The photo, taken in the ceremonial courtroom at the Lucius D. Bunton Federal Courthouse in Pecos, Texas, was first sent to Debbie Nathan, a journalist in Texas covering the US-Mexico border, and published in The Intercept last week. Taking and broadcasting photos in courtrooms is illegal under US law. The image has nonetheless been circulating among attorneys and legal workers in Texas since April, Nathan told Business Insider. 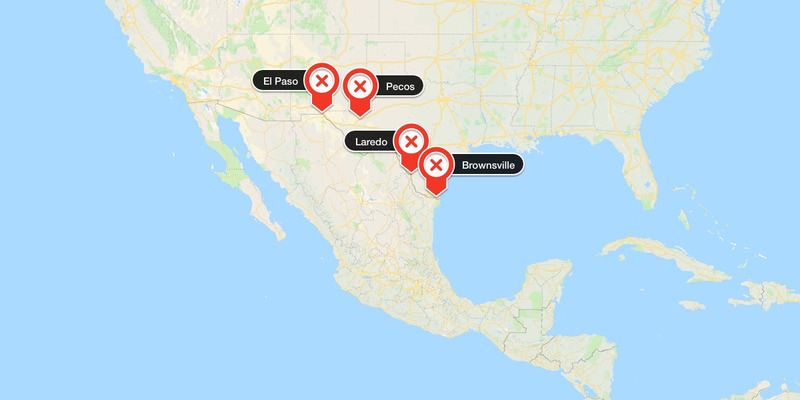 Such mass trials are not confined to Pecos: Similar scenes have been taking place in magistrate courts in the Texan cities of Brownsville, Laredo, and El Paso as recently as last week, Nathan told Business Insider. Defendants in Laredo and El Paso wore orange jumpsuits, while those in Brownsville were in street clothing, she said. 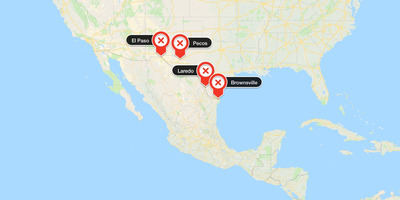 Google Maps/Business InsiderMass-immigration trials have been taking place in the Texan cities of El Paso, Pecos, Laredo, and Brownsville. In Brownsville, a judge questioned and sentenced as many 40 defendants in one go, Nathan described in The Intercept. In unison, defendants answered questions such as “Are each of you satisfied with the help of the lawyer?” and “Has anyone offered you anything or threatened you?” In one case, public defendants had less than two hours to speak with a total of 41 defendants, meaning they would have had just a few minutes with each of the accused. Mass trials like this have been happening on and off since Operation Streamline came into force in 2005, Nathan said. But officials have been cracking down even harder on cases along the US-Mexico border immigration since last month, when the Trump administration instituted a “zero-tolerance” policy in which even those crossing the border fleeing violence would be prosecuted. People fleeing violence or seeking asylum would be tried and children would be separated from their parents, Attorney General Jeff Sessions said last month.